The Sirui T-2005X 5-Section Aluminum Tripod is a very lightweight, compact tripod that extends to a maximum height of 56.9" and folds down to just 14.6" for easy transport. Weighing only 3.1 lb, the T-2005X supports loads up to 26.5 lb thanks to its thick upper leg sections and forged aluminum construction. 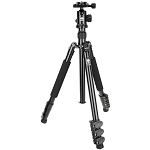 The T-2005X tripod is suitable for use with just about any head and any 35mm camera, DSLR, point & shoot, or camcorder. 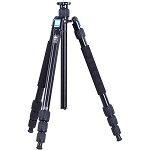 It's an excellent travel model due to its relatively light weight and the fact that its legs fold upward to achieve a folded length of only 14.6". 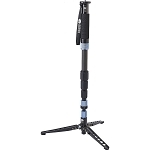 That's a figure that won't necessarily grow if you attach a head – the legs extend past the height of many head models that you'll mount, so the entire package stays very compact to fit comfortably in most carry-on bags and many backpacks. 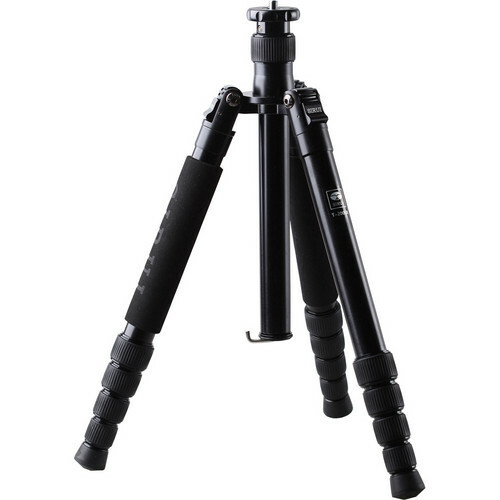 The tripod's center column is reversible, and the T-2005X comes with a short center column so that you can set up extremely close to the ground for ultra-low-angle shooting. 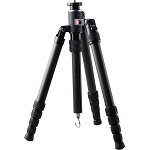 With the short center column installed, you can set the legs at their wide angle (80°) and shoot from only 5.3" from the ground. 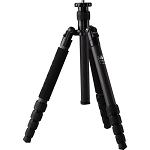 Short center column allows the tripod to reach extremely low positions – minimum height of 5.3"
Box Dimensions (LxWxH) 21.6 x 5.8 x 5.4"